Metropolitan Women's Group, LLC (Silver Spring) - Book Appointment Online! Metropolitan Women’s Group, LLC has been providing care in the community since 2003. As leading women’s health care providers in the community, our providers are female and Board Certified. 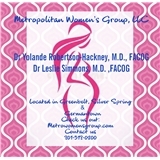 The focus of Metropolitan Women’s Group is women’s health issues, specifically obstetrics and gynecologic care. Our mission is to provide high-quality comprehensive care that is individualized based on our patient’s specific needs. We place an emphasis on prevention and medical excellence in a professional and caring environment. We are dedicated to helping our patients stay engaged in their care and provide the resources they need to live longer, healthier and happier lives. Our providers have privileges at Holy Cross Silver Spring and Germantown Hospitals. We welcome the opprotunity to serve you.